With more than a thousand visitors on the day and more than £500 in donations collected, RNLI Salcombe Lifeboats can certainly claim to have had another amazing Open Day on Wednesday 15th August. Two lifeboat enthusiasts from Yorkshire, brothers George (7) and Toby (5) Morrell on holiday in Salcombe, decided to spend their day selling homemade scones and in doing so raised more than £80. 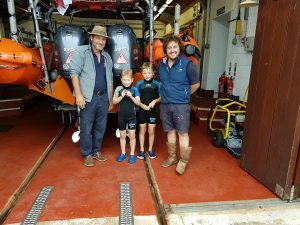 However, this meant they missed out on the tour of the lifeboats, rectified of course by Coxswain Chris Winzar and Mechanic Sam Viles who gave them a ‘peek’ when George and Toby came to the lifeboat station with their amazing donation. A massive thanks to all who made it a rather special day, included in that, the many members of our volunteer crew who gave their time – becoming ‘tour guides’ for a day. 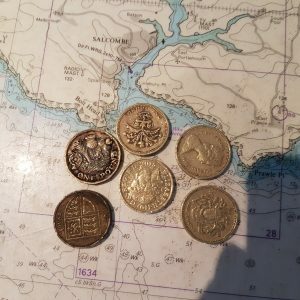 Are you still finding old £1 coins in and around the house? Banks closed in your town? RNLI Salcombe street collections this week! Our collecting boxes would be the ideal place for those old coins, along with any other denominations. 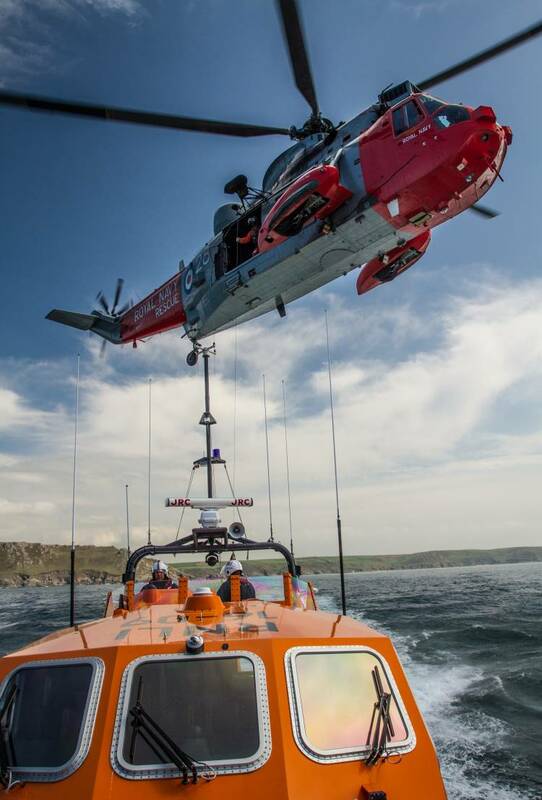 RNLI Salcombe Volunteer crew and supporters are looking forward to opening both the ALB and ILB Lifeboats to the public on Wednesday 15th August from 10:30 a.m. – 15:00. 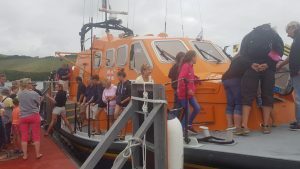 The Open Day gives the public, both young and old, a chance to get up close and see for themselves the lifeboats and equipment used by the volunteers to help them save lives at sea. All subject to operational needs. As normal the Lifeboat shop and museum will be open and joining us this year will be the RNLI Face-to-Face team. Raffle tickets for this year’s Autumn Draw will also be available. The RNLI Salcombe Fundraisers, the RNLI Face-to-Face team and Lifeguards will be present on Whitestrand to answer questions and give advice on the ‘Respect the Water’ and ‘Float for Your Life’ campaigns. Salcombe Lifeboat Fundraisers will be in attendance throughout the weekend with many souvenirs available, plus a selection of the RNLI 2018 Christmas cards, always in big demand! 28th July 11:00 – Kingsbridge Fair Morning only. The Salcombe Lifeboat Fundraisers have been invited, along with other charities to attend Quay side events during the morning. There will be a range of RNLI souvenirs available to purchase, just look out for the RNLI gazebo. 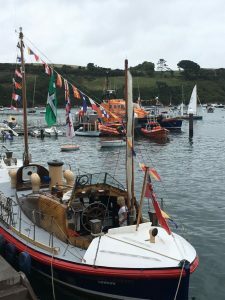 The RNLI Salcombe Lifeboat Fundraisers have been invited, along with other charities to attend Quay side events throughout the morning. 2nd – 6th July – Art Exhibition & Sale. 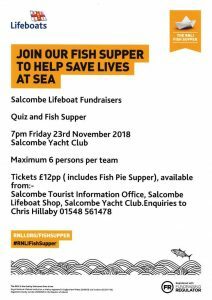 The RNLI Salcombe Lifeboat Fundraisers will be bringing together a display of work by local artists, with a variety of styles to both view and purchase. 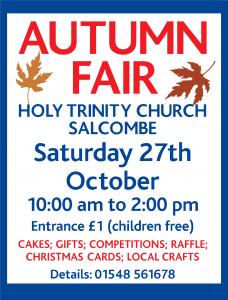 Entry to the exhibition is free of charge and will open from 10 a.m. until 4 p.m. daily, at Holy Trinity Church Salcombe. A donation from the artists will be made to RNLI Salcombe from the proceeds of works sold throughout the exhibition. Mr. Mark Dowie, RNLI Salcombe L.O.M. will give a service update.